By admin at Sep. 23. 2007. One of our garden club members sent an interesting article on catmint (Nepeta faassenii )as an alternative to lavender. Lavender is a tricky proposition in our area. Not only is it marginally hardy but it needs excellent drainage. Drainage, especially in the winter, is a major problem in areas with a heavy clay soil. It tends to grow best on slopes or in raised beds where the soil has been amended and the heavy clay subsoil does not exist. If these conditions cannot be met even if the variety of lavender is hardy to zone 5 it will likely succumb to our winters. Nepeta faasenii is not a naturally occurring species but is a hybrid of racemosa and N. nepetella. It is named for hybridizer J.H. Faassen, who produced the original cross. What are the advantages of catmint? The major one is that it is nearly foolproof. Like most herbs it will grow in poor soil and does better if neglected. Fertilizing, watering and fussing over herbs leads to weak growth and a reduction in the strength of the oils for which they are generally grown. 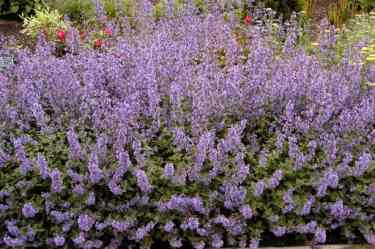 Plant catmint in full sun or sun/shade and forget it.Catmint is hardy to zone 3. The worst weather our winters can produce is not going to kill it. It isn’t too fussy about drainage (although it does prefer well drained soil) so it will survive wet feet during winters in which the soil doesn’t freeze early or there is more rain than snow. The plant puts our sturdy rhizomes so even if the soil thaws and freezes the plant isn’t going to be heaved from the soil.Catmint is drought proof. It isn’t going to require watering in the driest of summers. If it is grown for its aromatic qualities it is best grown dry. Catmint is a close relative to catnip (Nepeta cateria) but is not identical. Some cats will be attracted to it and some will shun it. Gardening legend has it that cats will destroy catmint that is grown from cuttings but are not interested in seed grown plants. The silvery gray/green foliage provides an excellent foil for other perennial border plants. It highlights the cool colors and tones down the reds and oranges. It works well with bee balm, daylilies, coreopsis and shasta daisies. It also makes an excellent foil for summer annuals such as zinnias, marigolds and geraniums. The bright blue flowers appear in late spring and depending on the variety will bloom for 2-3 weeks. Shearing the plant back will result in more compact growth and a second blooming period. For those of you who have trouble with marauding animals Neptea’s are not generally attractive to deer, rabbits or ground hogs. The strongly aromatic foliage is apparently not desirable as food and may indeed repeal animals that are converging on the more edible plants as lunch. The flowers however produce sweet nectar that is highly attractive to butterflies and humming birds. There are few problems with catmint but one detriment might be its ability to spread via rhizomes. This can cause a containment problem that may range from serious to mild. Some of the older varieties may run rampant through your garden and Jeanne says they are extremely difficult to remove completely. Mine are not particularly hard to dig out and I’ve managed to keep them under control. A number of sources suggest planting the newer named varieties in groups of three so it is possible that these plants do not spread as rambunctiously as do the older varieties..